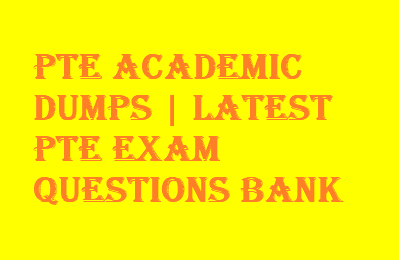 Dear exam aspirant we are sharing latest 2018 real exam question. If you want desired score in your upcoming PTE exam you should go through these PTE Exam test 1( PTE Exam Dumps- January and February 2018). These questions are collected by us from our different sources. If anyone has given recently PTE exam then they can share their exam questions in our comment section. –Television has many useful functions to play in everyone’s life, for some its relaxation, for some it is the companion. Discuss your viewpoint and support your answer with examples and discussion point. –It is usually foolish to get married before completing your studies and getting established in a good job. Do you agree or disagree? -Marketing dept of Company which produce consumer product such as food should emphasis on company reputation or marketing sales, discount? -Value added by travel in Education. Is travel a necessary component of education or not? Will student sitting at home have more knowledge? -Wales language speaker but more about statistics. -While concealing ideas is desirable, basic underlying issues must first be addressed. -The toughest part the research for postgraduate students is funding. -Animals raised in captivity behave differently than their wild counterpart.